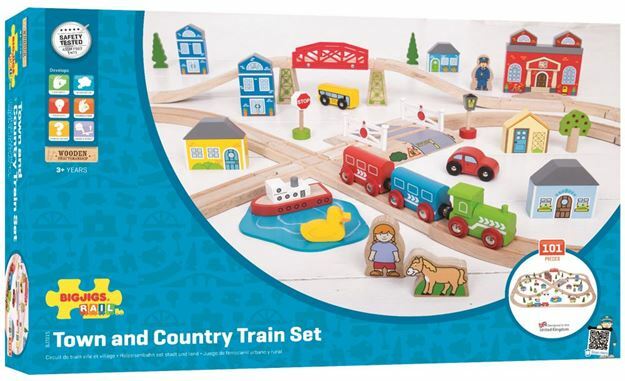 This 101 piece Bigjigs Rail wooden Town and Country Train Set will inspire and educate young minds in equal measure. From the town station, take a ride to the country store, through the woodland and out to the river before returning home again. Includes: a wooden engine, 2 carriages, track, wooden houses, shops, village and country folks, cars, signage, trees, a bus, a boat, pond duck and level crossing. Age 3+ years. Compatible with most other wooden railway brands. Distributed in New Zealand by Holdson.